Everybody is beginning the new year with faithful resolutions. So, are we. But we consider objectives instead of resolutions. Because resolutions are meant to solve an issue. We don’t really have issues… 🙂 What if we speak about objectives to achieve or trying to at least? Have fun, have a run! Again this year, we will focus on the PLEASURE to run. Yes, because, loosing fun to go out running, it happens. But it is not easy to live. So, having realistic objectives or the good method to go out can help, but before all, it is more about desire. Keep desire. How? It is subjective. It is all about BALANCE: adjusting between the no-desire and the outright laziness, between the desire and the “I have to”. You certainly asked yourself the right questions, anyway, for all situation, to begin is the good answer! You will find plenty of ressources and tips to begin running on the Web. And your first experiences should help more to find and adapt your own method and rythm: your goals, going easy, learning to know you better, solo or in group,… Maybe you will wait for better days, better weather, depending on where you are on the planet? Winter is also a very enjoyable season! 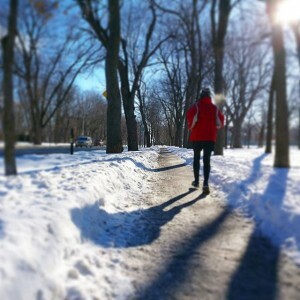 In addition to improve your physical conditions for spring runs, enjoying winter by going out… is a real happiness! Sure, gear is needed and you have to try. To try several times. And to try more than 5 minutes – the time for the body to warm up – and then appreciate. La Maison de la Course is the house you need! 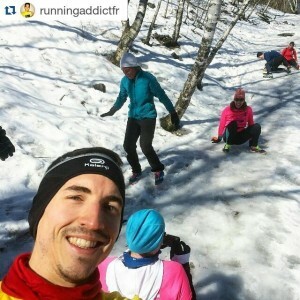 Information sessions like the one about “Courir l’hiver” (=Winter runs) to learn best practices to run during winter and all year round, running classes called “cliniques” to help you training towards your goals, right specific equipment and over all, understanding and useful tips! Even if, for any good reason, you would prefer begin at spring, you should take their tips and develop your interest. If you are convinced that winter is not for you, you are right to wait for spring: don’t demotivate yourself trying in winter ill-equipped! Because benefits of running are worth it! And nobody can judge you for that. To us (and to many people), happiness is in the moment. We apply what we preach. We are conscious of the moment while we observe what is around us. Even running. Running and discovering, it is our thing. 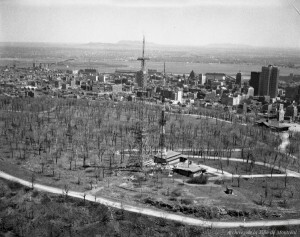 By the way, did you know that, the Mont-Royal Cross counts 240 bulbs and is visible from 48K? French adages say “nothing is served by a running; one must leave at the right time” or we “run after” something (happiness?). Those proverbs are quite negatives. But for us, as “happiness is to be found along the way, not at the end of the road.” (says another adage), running is an objective. As simply as it is. 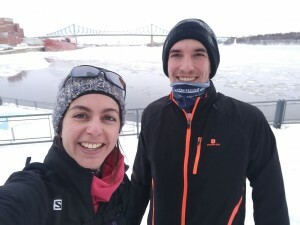 This entry was posted in Uncategorised and tagged activity, discover, equipment, heritage, Montréal, running, running tour, winter. Bookmark the permalink.